Do you love a great homemade cobbler? Then you're really going to enjoy this recipe! 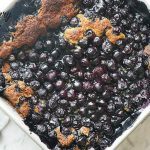 Homemade Blueberry Cobbler, delicious easy and a real family favorite. Great Grandma Darnell was quite the cook and I'm excited to share this recipe with you! Grease and flour an 8x8 inch pan. Combine the blueberries, 1/2 cup sugar and 1 tablespoon flour. Mix well, set aside. Cream together 1/4 cup butter and 1/2 cup sugar. Sift together 1 cup flour, baking powder and salt. Add to the creamed butter and sugar. Add the milk and blend together. Spread in the bottom of the 8x8 inch pan. Pour the berry mixture on top of the dough. Over all, pour 1 cup boiling water.